Weather Report: Low 44, High 76. Dark clouds at sunrise with some sprinkles. Morning had mostly blue skies with a little hazy with temperatures in the 60s. Afternoon saw thickening smoky haze and a few clouds with temps in the mid 70s. Evening was very smoky in the sheltered cirque of Hopkins Lake. Wildlife seen: Deer, chipmunks, ground squirrels, tree squirrels, hoary marmots, several flocks of grouse, just like yesterday. The campsite last night was really great; I sprayed the rim of my Tilley hat with the eucalyptus bug juice to keep the mosquitos away and finished my book. The bug juice had no effect on this one doe, though, who was both cute and annoying. She made several approaches to my tent during the evening as I sat on the log next to my tent, keeping the tent between me and her, apparently obsessed with my sweaty undies and shorts drying on top. Geez, deer, go away! I'd yell at her and wave my hands and she'd bounce off beyond the trees. That usually gave me about ten minutes more of reading, until she tenaciously and tentatively made another approach, and the cycle repeated itself again. Finally, after four or five go arounds of this game, I stuffed the mostly dry undies in a ziploc bag, and hid the shorts inside my pack inside my tent. It didn't stop her from clomping around the tent during the evening, and then again throughout the night. She learned pretty quickly that my blustering words of "go away Ms. Deer" didn't really mean anything, sigh. When I got up this morning, Ms Deer was laying down in a little thicket of tree trunks nearby, gazing at me. Geez, Ms Deer, don't you have anything better to do? I went a few feet away to the grass to take my morning pee, and she immediately got up... and followed me, hovering. As I moved away she zeroed in and started licking the tree trunk and small herbs I peed on. Aha. That's what all those pesky deer these past few nights have really been after, the salty goodness of primate piss. Yet another tip for camping in these woods: pee far away from the tent for a sounder night's sleep and fewer annoying deer encounters. I was feeling particularly lazy this morning as well; it's now just 33 miles or so to the lodge at Manning Park, and 26 to the Monument. There's a campsite at Castle Pass, but it's dry, and a closer one at Hopkins Lake, which is only 17 miles away. That sounds like the better option, so there's really no rush today. From my camp, the trail was flat and fast, heading up over a shoulder then to Shaw Creek, where hoary marmots scooted along the trail out of my way. I got another liter of water, as I've been gulping about a liter every five miles, and water sources seem to be every three to seven miles apart. It's better to have a bit too much water than not enough. The trail leveled a bit, and while it went along a ridgeline there weren't many views through the forest, then dropped a thousand feet of elevation to Holman Pass, with a nice log to sit on. 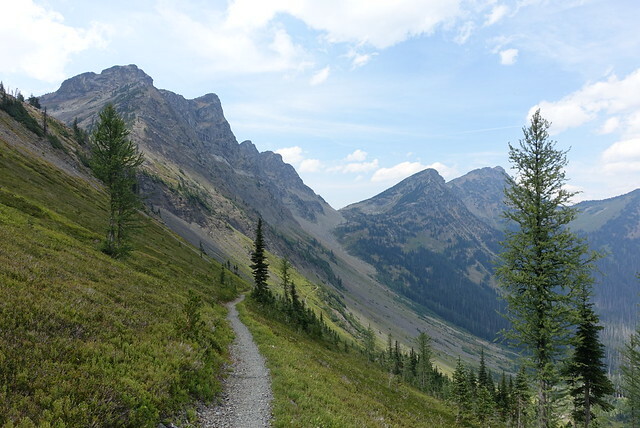 From Holman Pass, the trail lead around grassy meadows, over spectacular Rock and Woody Passes, then along a ridgeline before dropping into Hopkins Lake, which looked like a wonderful place to stop for the night. I alternated between really enjoying the scenery and really pondering the meaning of it all, as far as my journey on the PCT goes. I felt that an endeavor this long and this strenuous must have some takeaways. This was my second to last day on this long odd journey: what have I learned out here? I realized that I haven't "learned" much, in the sense of uncovering previously hidden knowledge, none of this is anything new. It's more like the knowledge is already out there, I kinda sorta can sense its outline, and I just made the effort to explore it a bit and get closer and see what it's all about, and see how it's changed how I am and act and behave and feel. A long ways back on the trail I found my time on the PCT has made things feel less fuzzy and less gray: for instance, how many miles I can hike a day is pretty clear, with a fairly defined line (22, 23 miles is fine; 24 or 25 is not). Things have become more black and white, unexpectedly. The "learnings" I tossed around in my head today also seem to come in similar pairs. Anyways, I'm now a bit more patient, and more willing to just let things happen when they happen. I can't make the bus come any faster, I'm going to need to wait another 20 minutes. I can't make the rain showers go away, they'll finish when they want to, or not. Maybe this isn't because I'm on a clock--I don't care if my commute to work was 'slow' at 29 minutes, compared to the more typical 25 minutes, simply because I'm not working at the moment :-). There aren't a lot of these metrics to measure on the PCT (with one big exception), it's really about the personal experience. The flip side of that patience, though, doesn't really have a good English word, but I'll call it action. I'm finding that I don't hesitate as much in making a decision; I don't do the 'wait-and-see' as much. I generally have enough information to act, even if that information is spotty or incomplete; some action is often better than no action. There's also touch of better self-awareness, and more than a bit about asserting control over what's happening. The 'patience/action' duo leads right into the next pair, 'research/adapt'. On the PCT you get many hours of trail thinking time (this really means just daydreaming), watching and observing what's around you, and planning out the next few days and what might happen 'if'. Generally I'd find myself formulating options by asking myself questions: how do I get to town, hitch or bus? Is it a weekend, meaning more daytrippers and crowded campsites but less transit service? In town, do I want Mexican food or a burger? How many days resupply do I need to buy? 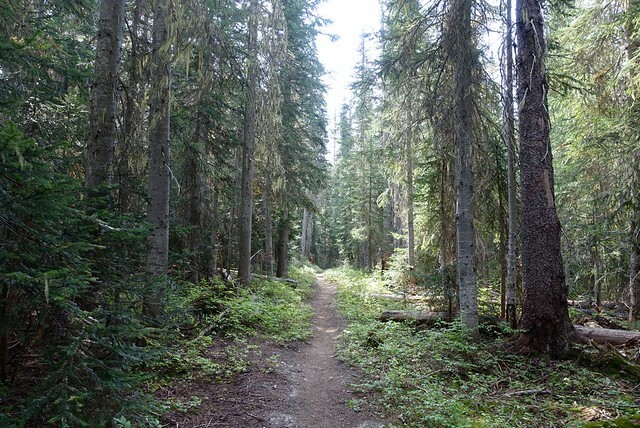 What if the wildfire closes the trail? Will the brewery be open on Monday? Will the next campsite have water, or do I need to make water beforehand? How far do I have to carry that water? What if it rains? 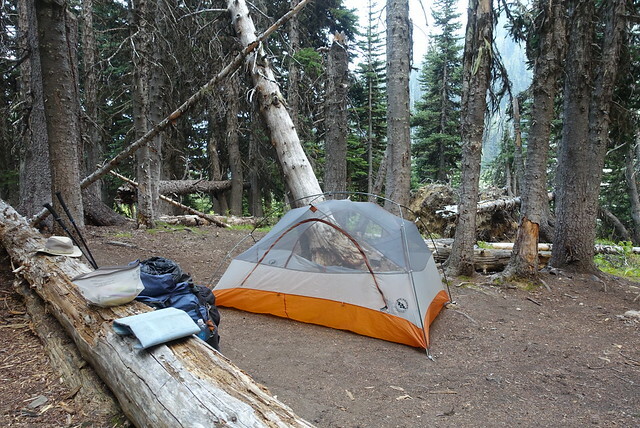 Will the campsite be windy or cold or bug-infested or crowded? Will it have a picnic table???? There are dozens of questions that pop into my head when I'm hiking, and eventually they coalesce into a few viable options. The 'adapt' side of things, is nothing more than just applying those researched options to current conditions. It can seem a bit abrupt at times, but if it's been raining for the past several days and all my gear and clothes are soggy and fermenting, I'd gladly shift plans and not put in another 20 miles tomorrow (and instead sleep in a warm bed, thank you Tahoe Dave.) If a fire's closed the trail, figure out which bailout option to use. If no one's around to hike over that really high pass with a huge maybe scary snow bowl on the north side, just wait another day for another hiker to show up. Probably the biggest part of adapting, for me, is not being stubborn, and not being anchored to the previous plan and some mileage plan I made assuming perfect weather and no injuries and plenty of food, a plan that really isn't going to work out as well with the current conditions. This last little bit of 'adapt' led me into thoughts about how to frame my PCT journey; people love hearing stories and are very curious. A long while ago in southern California, I realized that any PCT journey isn't really a narrative, it can't be easily packaged into some plot-driven or character development driven movie-of-the-week. So I call this learning the "experiential/narrative" duo. Experiential looks very messy from the outside, just a collection of ad-hoc moments; it can even look ill-disciplined and impulsive. It might be, but it's often not, it's just that all the trail time and current conditions and feelings and experiences out there really don't translate well into words. That contrasts with the 'narrative'. Hiking the entire PCT all at once (2660 miles! ), is easy concept to grasp, it's a simple story to tell and get your head around. The PCT is very well documented and known, mile by mile. As a hiker it's easy to feed yourself the script of "I'm going to hike every single mile" or "I'm going to have an unbroken chain of footsteps from Mexico to Canada", really commit yourself to the trite 'no skips/no flips' blather that many hikers buy into at the beginning of their PCT 'thru-hike', with 'thru-hike' being a term I despise. But, as they say, life is messy and so is the trail. There are trail closures, inclement weather, injuries and maladies, just so many things out of your control. So I've learned to use patience and know your options and adapt. Maybe it is important to you to follow that narrative you've created for yourself, go ahead, hike your own hike. For me I've found that letting go, Making My Own Hike, and experiencing the trail and myself as they are at the moment is far more satisfying than having any sort of conveniently packaged story to tell. That's more than enough blather for today. Tomorrow I'm headed on north, across the Canadian border. I'm curious how I'll feel: will I feel like I did when I graduated from university? Will it be more like crossing the finish line of a 10K run? Or will it be more like the referee blowing the whistle at the end of a rugby match? It'll probably be none of those, or all of them plus more.